Welcome to the Wolfenstein: The New Order Weapon Upgrades locations guide that helps you find the total of 12 Weapon Upgrades locations in the PC, Xbox 360, Xbox One, PS3 & PS4 first-person shooter game. It doesn’t matter if you save Wyatt or Fergus from Deathshead in “Chapter 1: Deathshead’s Compound”, both timelines give you the ability to pick up the Weapon Upgrades. There are total of 12 Weapon Upgrade Locations to find and unlock, including 7 Laserkraftwerk Upgrades (LKW Upgrades)! The Timeline for all these in-game Weapon Upgrades locations is listed below. How to find missing Weapon Upgrades? : In-game the Weapon Upgrades will be hidden in various boxes and such. Walk up to each box and an icon will appear with a weapon & up arrow for you to take action to open up the Weapon Upgrade box. Inside you’ll see the actual Weapon Upgrade and you’ll automatically attach it to your weapon. 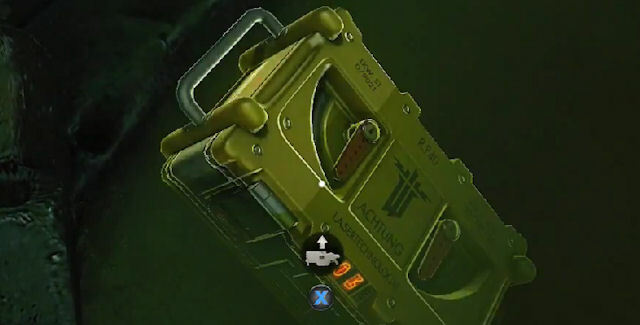 – It can be confirmed as being Weapon Upgrades simply by walking up to & looking at it, as the on-screen icon will then indicate you can press the action button/key (X on Xbox / Square on PlayStation) to pick up the Weapon Upgrade. The locations listed below are for a “new” game: If you miss a Weapon Upgrade on your first playthrough, it can happen that it is somewhere else again later or you get the weapon’s previous update together with the newest update. It’s sometimes confusing, but the 12 locations shown in the video guide here are definitely the places where the upgrades are for the first time. Does the game save each Weapon Upgrade you collect? : Yes, the game will automatically save the Weapon Upgrades you just collected (granted you picked up the Weapon Upgrade you encountered), so you don’t have to play to the next checkpoint or the end of the chapter. After picking up each collectible you can safely quit the mission without losing collectibles progress, and your progress even carries over to a brand new game. Which is ideal when you’re playing on a higher difficulty level on your second playthrough, since you can then max out your Weapons arsenal, Armor AND Health (check the list at the top of this page to see we have guides for both of those too). Where to find all Weapon Upgrades in Wolfenstein: The New Order? The in-game collectibles locations for the Weapon Upgrades are described in this detailed video guide by 360GameTV. The Weapon Upgrades are listed in the video in the order that they appear chronologically. • No Weapon Upgrade here. Huge thanks to 360GameTV for the guide video and tips. Special thanks to Lajos for figuring out what the final LKW Upgrade does! Please comment if you have any additional Wolfenstein: The New Order Weapon Upgrades location tips of your own, we’ll give you credit for it. – Thanks for visiting!